Item is a reproduction of a postcard depicting what is likely a militia unit at Richmond around 1916. The unit was probably made up of people who were too young or otherwise unfit to serve in the regular forces. The inscription on the verso lists the following names: featuring Rollie Elliot, Chet Kearry, Riggins, Arthur Pope, Elmer Cleveland, Stuart Morrill, ? Blake, Elmer Stockwell, Stuart Only, Eddie Smith, Dan Tounes, Harry Pugh, Stuart Messenger, Henry Smith, Ivan Adams, Leslie Porter, Stuart Hamilton, Arthur Messenger, Russ McKee, Duncan McCallum, Brooks Hamilton, Henry Carson, Bertie Barlow, Herbie Robinson, Ralph MacBain, Serg. ?. 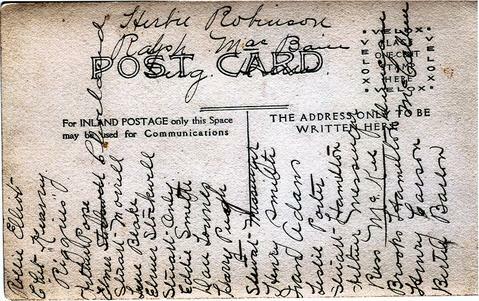 The postcard was copied in 2019.